Part of my back garden and dog run area, viewed early morning in April from the kitchen door. Blackbirds are nesting behind the Viburnum burkwoodii, on the right, very close to my house. This is absolutely beautiful Terratoonie. It is like a picture postcard. Spring is definitely my favourite season. This pic. was taken early morning and Truffle was still eating his Rice Krispies and goats milk. It's a hard life being a Smooth Fox Terrier ;o) Lol. The dog run is so useful in that I can do tasks such as use the lawn mower while at the same time enjoy having the dogs outside safely with me. Hi TT, That is a good idea to have a dog pen, where they can see you but not interfere with your work schedule! You have a beautifully neat looking garden. Love marge. you have been hiding your light under a bushel as they say!added to favourites! The "fencing challenge" is all happening over to the left out of camera shot... Lol. The dog run gets the sunshine from mid morning onwards and Truffle has already become an expert at sun-bathing. The dogs can go back into the cool kitchen if they get too hot.... tough life being a doggie.... Lol.. Very pretty garden, packed full of goodies (including Conker!). I love your row of chimney pots. You must work very hard keeping it like this. So gorgeous! Don't think I'll ever look at my garden the same after seeing this. How long have you been perfecting this beautiful space? After my day today digging up new beds I really appreciate the amount of work that went into this. I'm pleased you like the chimney pots ~ I collected them from my mother's garden after she died. My mother had filled them with soil and planted that way, but I prefer to put smaller pots in the tops which I can interchange. Currently these chimneys are being moved further and further away from the edge of the dog run, because Truffle the Terrier puppy is growing taller and taller, and trying his own version of topiary on the pansies ! Lol. I spend a lot of time here. I've been working on this garden for over seven years, but during the first years, it was more like site clearance ! I removed debris, replaced old fencing, dug out overgrown brambles and chopped back huge unsuitable trees which were dominating the space. If I had been able to start with a blank canvas, that would have been much easier ! Lol. You have a beautiful garden TT. Truffle is at the stage of wanting to strim anything green. Lol. How 's his teething now ? He stole one of my socks yesterday..
two top, and two bottom front. Will I have any socks left I ask ??? Stunning garden view - it's lovely. So many plants flowering in succession at this time of year..
What a very pretty garden! A mixture of an artistic eye and a lot of hard work. If this was mine I'd want to spend every spare moment I had out there. The bench that I can see looks an ideal place for having a cup of tea! From that bench I can sit and look back at the dogs and also across at the raised bed and the bird bath. Must admit, I'm usually gardening and don't seem to find time to sit. Must make time. Lol. Love the aubretia in the raised bed - lovely range of colour everywhere. Hi Conker, looking beautiful as ever. The aubrieta and sedum I'm doing the exchange with you are both below that raised bed. Got your name on them. Conker put the labels on. Lol. Your cutting from the armandii, top left of picture, is still looking alive. Early days yet. You'll be reassured that Truffle is in charge of looking after your cutting. LOL. LOL. LOL. I agree that this is exactly like a postcard. I am jealous of all your space and ability to have such a lush green environment. That just isn't possible in water starved Arizona. Your animals bring a big smile. this looks stunning TT, you have a lovely garden and have worked very hard,, mind you ,,,you do have great little helpers dont you! or is that the other way round ? Lol. absolutely gorgeous TT, a garden to be proud of..nice and tidy and so colouful,well done....... when is the next gardenparty??? Tiny tea-time-size bone shaped biscuits will be served. Lol. Oh TT, how did I miss this photo ? Your garden is absolutely stunning - you can see it is brimming with much love and lots of hard work - so when is this garden party going to be then ????? You can bring Rosie and James Dean. Lol. If James Dean comes, he'll have to come with Bebe, his latest pet - a black and white lamb . . . !! No wonder the neighbours want to look into your yard....sorry but can you blame them? lol. Thank you. I've some pics.on GoY from my back garden, such as two of Garrya elliptica "James Roof" , two of Clematis armandii, one of Clematis cirrhosa "Wisley Cream". Nearly all the photos of my dogs are also in the back garden.... plus the pic. of Gromit with the chubby pigeon..Lol. I'll try to take more photos as the summer goes on. Have you put a photo of him with the lamb on GoY ? It's so good to know Rosie is improving. I have that same Viburnum along one of my side walls. It is only about 3' tall right now, but I have the entire wall for it to grow along. Chose it for its evergreen state and pretty white flowerettes. Glad to see what I can expect in future (should I have that much future left, one never knows). It has definitely established itself. Now to see how it handles the hottest of summer sun. I planted it last October and it wintered well. New growth showing and blooms appeared in March. Think it will do just fine. I hope you have many years to enjoy your Viburnum ! It is a good evergreen. The white flowerettes don't last all that long, but while they're out give a spectacular show, and have a lovely perfume. Mine faces the south so gets all the sun of a British summer, but nowhere near as hot as Az. ! very nice garden, must be hard work keeping it like that! Everything carefully arranged around the pets.. Lol. I'm pleased you like my garden. I'll take more photos. He looks so lovely :o) Lol. Beautiful spring garden, well done! TTyour garden is absolutly stunning, a credit to you. I enjoyed your photos of your recent visit to Harrogate Flower Show. Delightful, TT. And you can enjoy it from inside your kitchen too. Great planning. I'm sue we'd all like to come and walk around it, and sit for a while admiring your hard work. Beautiful. So many excellent comments on your garden and I must say I agree with all of them, your garden is a credit to you. EXCELLENT. Just come across this smashing picture, your garden is a treasure, would love to wake up and see this every day. Not only great Terra but heavenly! wonderful outlook and and the very best company! What a lovely peacful place your garden looks, it is a tribute to you. Fantastic garden and lots of gardening hours must have been put in to get it looking wonderful like this. Well done. I know everyone else has said it, but wow! Simply stunning! No wonder Conker and Truffle seem to be in all your garden pics, as they follow you into the garden, a true haven, bliss! Soooooo green, I'm "green" with envy! You must be really fit to have done all that work in the last 7 years! Well done, no wonder you value your privacy. Nasty neighbours! Does Truffles get a reward for obeying the rules? I taught my cat Twinkle to sit stay come and heel etc by biscuit reward. Yes, Truffle gets tiny biscuit treats as rewards during training. I'm not putting any pressure on Truffle. It's best to let Truffle come on gradually with his training. Otherwise he may not do anything for you. Animals can be funny creatures at times. I think they like the attention. That's lovely TT - do I see a bench through an archway at the back? Is that another section of your garden? The bench I inherited from my mother, but the wood sections were rotten, so I replaced them, and re-painted the metal parts. I find the bench a very useful place to put small garden tools which I take out of the shed. LOL. Could you maybe put some criss-cross trellis behind the arch to make it a sort of focal point, with some kind of ornaments attached to the trellis ? Yes, that's a good point re the birds - I hadn't thought of that... but I'm not going to use the mirror anyway - think it would be too expensive and also I'd rather look at the rose ;-) If you have a look at the picture of the arch you'll see I've put a brass disc on the fence as a kinda focal point - it's actually an old fruit bowl type thingy, but one of the legs dropped off lol Think it looks kinda celtic - like a sun disc or something? A few monoliths perhaps lol I'm hoping to get another bench underneath too. btw.... the leg fell off the fruit bowl when it was looking at the lop-sided arch. LOL. TT, you have such a beautiful and fantastic garden....congratulations to all your hard work! .... it's a long way up to the top again.. Lol. ... Sid and I had a lengthy conversation today. LOL. hi TT you have fantastic garden ,I like it too much ,it is marvelous. Thanks for your comments. I like your garden, too. All the stonework and paths you've made are very well thought out and decorative..
Spring is when life starts getting really hectic for most gardeners ! Lol. How beautiful, and shows the work and love you put into it. Love your garden,so many plants and greenery,great job well done. Very nice. I love it. I have to get some winter interest. What all do you have? You can see some winter interest climbers on my other photos. What a lovely picture - so clear and sharp. What a great scene to see every time you open the door. What a stunningly beautiful garden and Conker looks so regal there. What a beautiful garden - i love the way it all co-ordinates - don't fancy doing mine, do you? The lobelia looks stunning agains the rich greens. I can't keep up with the work in my gardens. Lol. Are you looking at the mauve flowers, far left on the raised bed ? TT, This is extraordinary. It looks like a hand painted photograph, like they used to do back in the old days. It's just beautiful. I am really trying to understand the dynamics of my garden: The sun, the soil, etc, so that I can turn into something beautiful. Very inspirational. Hope Conker is feeling well. Glad you like this pic. Conker is doing quite well on his chemo thank you. Your garden looks absolutely gorgeous. What a beautiful garden Terra! 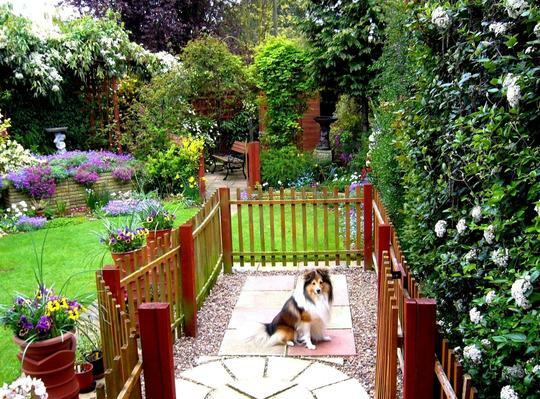 Your garden is a credit to you - looks like a fantastic place to be with your dogs. I've read your profile ...that you're developing a cottage-style garden. Don't hold your breath just yet TT, I've got a long way to go! Your garden is beautiful TT and it's nearly that time again! Yes, nearly that time again... ! wow this is my idea of heaven !!! how lush . We have not long been in this house so have just started our back garden project ! So i came on net to find some plants and came across this site ha i love it ha . Have just finished the fence and decking so very excited to start putting plants in ! ha so if it looks as good as yrs in 10yrs time ill be very very happy ha . WOW! your garden is great! there's nothing more to say....I'm jealous. You garden is a paradise Tt.You have done a perfect justice for both flora and fauna. Really gifted TT, just discovered it, and looks like it will be rediscovered for a long time yet! i have only just found this ~ what lovely planting ~ at all heights ~ that takes some planning and artistry. i have viburnam burkwoodii ~ mainly cos my dad liked it [i would love the scent] but it doesnt flower well ~ does it like the sun? I have only just started looking at the goypedia page and saw your garden. It is absolutely fabulous. You should be very proud of what you've achieved. When I first took on the garden it was full of old rubbish with some huge conifers all in the wrong places ! Breathtaking! Love your dogs as well. So you have a dog run area? Hmmm what a great idea! Your garden looks awesome, congrats. The dog run has been a success from day one .. I put a lot of thought into the design .. This is great terra! We need a dog run in our new home, and it have just had a great idea from looking at this! thanks ever so....the whole picture is lovely! Cottage Molly has been a bit of a challenge lately terra! but she's now on a tummy tickling regime (to convince her that actually she isn't the boss of me!). Yesterday she stubbornly refused to eat any of her food....just the food she's been eating for the last six months for her bladder stones....but she finally gave in this morning and ate her breakfast. Stubborn? You wouldn't believe it! Just like having a grumpy toddler! I am going to change her food soon, but at nearly £3 a can, I think we will be finishing up this tray....it's going to be a battle of wills again! Hope that's right terra....could be.